Electricity was in the air as a standing-room-only crowd packed into Dupont Circle’s Bier Baron Tavern for the April 2017 meeting of the Washington, DC underground storytelling smash, Perfect Liars Club. And as the show’s recognizable theme played over the PA, everyone in attendance pondered the same elusive question -- would tonight be the night that the audience returned to its liar spotting ways? Did Mikael hit rock bottom the night he was sprayed in the face by a skunk in the backyard of his filthy group house in Frostburg, Maryland? Did Erin deejay the punk rock wedding of a terminally ill teenager that ended abruptly when the affair’s unruly guests were pepper sprayed by drag queens? Did Tija get more than she bargained for after a chance encounter in New York City with British actor Mark Rylance? Did David’s travel anxiety get the better of him when he tried to exchange money on the black market in Argentina? Could Mikael identify the Frostburg State mascot? How did the caterers at Erin’s punk rock wedding treat the pepper sprayed victims? What is the name of the theater that Tija was invited to by actor Mark Rylance? What were the denominations of the bills that David had stuffed in his pants prior to the money exchange? ​​If the frequency and sheer volume of questions directed at two of the night's four storytellers were any indications, the rapt audience had concluded early on that either Mikael or Erin had fabricated their tales. An observation that was confirmed when the audience votes were tallied. Mikael yielded a whopping 46 votes. Erin topped Mikael by 2 votes at 48. And Tija rounded out the top 3 vote getters with a comparatively measly 26. David received so few votes, the vote counter didn’t even bother to tally the few remaining raised hands. Such a confident audience! Clearly, if hunches were to be believed, the liar was either Mikael or Erin. Undoubtedly, he or she would sheepishly step forward when the liar was announced and nearly one-third of the audience could go home feeling victorious and vindicated. A drumroll reverberated through the Bier Baron. Anticipation and excitement reached a fever pitch as the audience awaited the reveal. 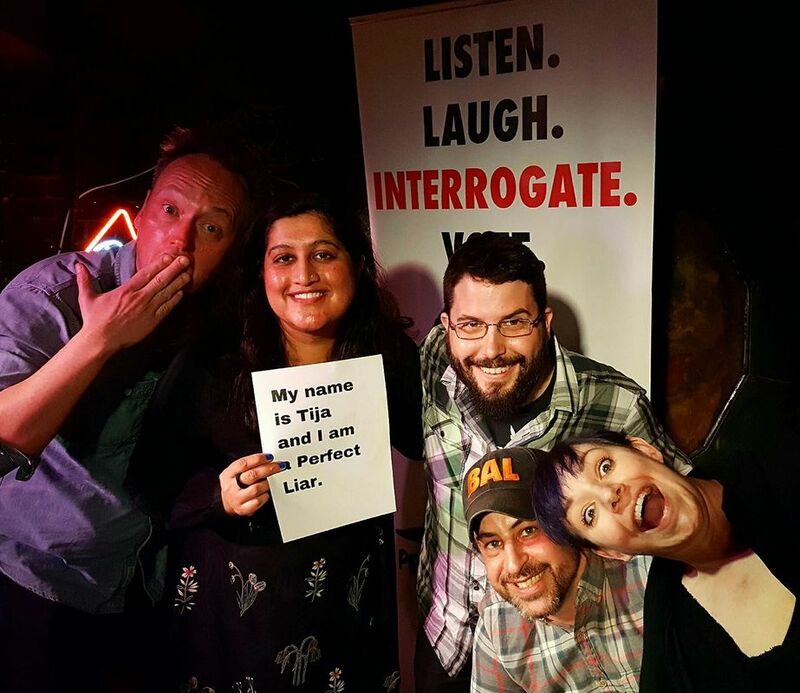 And, as the night’s liar stepped forward… a mighty gasp erupted from all in attendance, as Tija stood before them all -- another liar unspotted by a far too confident audience.